First and foremost I have to say a huge Merry Christmas to you lovely readers! I hope you all had a lovely day and picked up some great bits in the boxing day sales too! Although Christmas is an incredible time of year, it's true that it's an extremely stressful time for some people. Present buying can be crazy, spending hours preparing and cooking a huge Christmas dinner must be exhausting, and I know that for me, a bubble bath is just what I need at the end of the day to de-stress. So, for any of you whose Christmas has tired them right out, I have just the thing for you. In a sense, this is my three step wonder routine to feeling instantly more relaxed. 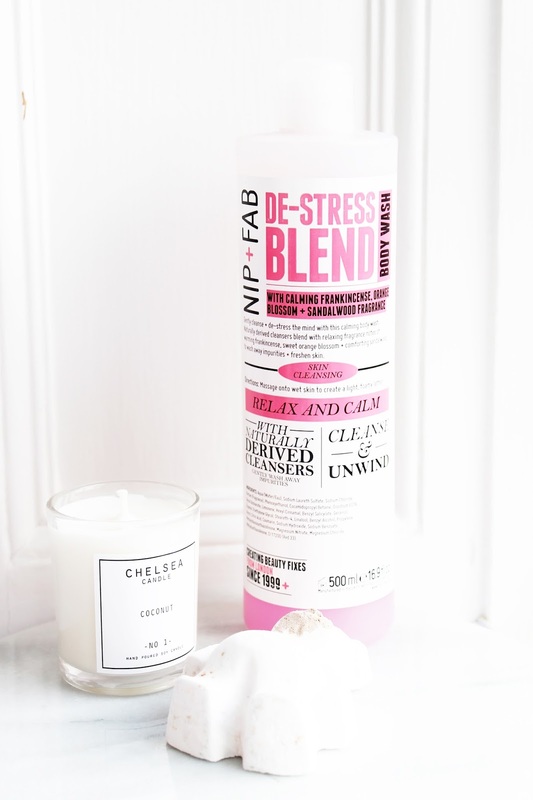 Firstly, I love a good scented candle, this coconut candle by Chelsea Candle Co smells absolutely beautiful; it fills the room with the calming, sweet but not-too-sweet scent of coconut and I don't know why, but it makes me think of an exotic beach holiday and it cheers me right up. Chelsea Candle's are made of a high quality soy wax, and are priced at only £5 which, for such a great looking and great smelling product, you really can't beat. The second staple product in this relaxation remedy of mine is the Nip+Fab De-Stress Blend Body Wash. It has fragrant notes of frankincense, sweet orange blossom and sandalwood, perfect warming smells to relax anyone with a working sense of smell! This body wash contains coconut oil which is perfect at making your skin feel fresh, smooth and generally just luxurious. My third and final product of choice is any kind of both bomb, this one specifically is Lush's 'Butterbear' from their Christmas collection. I love any bomb that smells delish and makes my bath look colourful, ironically this bath bomb simply makes the water turn milky white but that's besides the point! I'm sure you all understand the bath bomb hype, but I've jumped on it at full speed and I might just have to go have a bath after writing this post! What's something you do to relax after a stressful day? The nip and fab body wash sounds so nice will have to give it a sniff. It smells so so good! Butterbear is a real treat, I promise! It makes my skin feel SO good! The Chelsea candle looks so nice, I can't believe they're only £5! I'm definitely going to pick some up. Butterbear is one of my all-time favourite Lush products, I'm so annoyed that I didn't get any this year! Also, this photo is beauuuutiful! The candle sounds lovely and such a bargain price too - can't really go wrong can you? You are totally right about relaxing after Christmas, it can be such a stressful period! You honestly can't go wrong with these candles, they're a beaut! The coconut candle smells amazing, I might just have to try it out! I just stocked up on butterbears in the lush sale, they are one of my favourite! I've never heard of that candle company before, they they sound fab and such great value! You had me at coconut candle! If I'm stressed I like to have a bath, with one of my favourite lush bath bombs, some candles and just chill out! I keep seeing people rave about nip + fab products, about time I gave them ago, all of these products sound great!